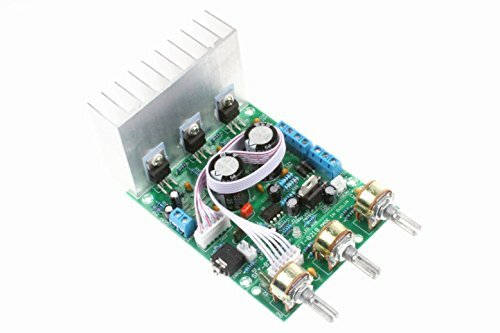 TDA2030A 2.1 3-Channel Subwoofer Power Amplifier Board, 18Wx3 power, peak up to 25W. High SNR, almost no static noise, super good sound quality: treble fine, soft, transparent, bass solid, full, strong. The core of the circuit is three ST brand new TDA2030A integrated blocks, two of which are responsible for the left and right channels, and the other one is for subwoofer use. A dual op amp NE5532 is used for bass preamplifier to make the bass strong and powerful, and the treble is crisp and sweet. The actual test drives the 100W 8 inch Swans loudspeaker with ease. Component materials using five ring high-precision metal film resistors, monolithic capacitors, polyester capacitors, electrolytic capacitors, connecting speakers and power plugs all use 5.08 terminals, the entire wiring process requires a small screwdriver, no need to solder on the circuit board, It is suitable for electronic enthusiasts and audiophiles to quickly improve and repair multimedia 2.1 amplifier system. Left and right channels: TDA2030Ax2, power: 18W+18W, it is recommended to use a 2.5-4 inch, 4-8 ohm 10-30W full-range speaker. Bass output: TDA2030Ax1, power: 18W [≤ 250Hz], 5-8 inch, 4-8 ohm 20-50W bass speaker is recommended. Board size: 79x95x60mm (LWH), including heatsink height. Pitch board size: 79x23x25mm (LWH) without potentiometer handle length. Potentiometer shaft distance: 28mm potentiometer mounting hole diameter needs 7mm. Cable: The motherboard and tone board equipped with a 30CM long 6P cable connection. Left and right channels: TDA2030Ax2, power: 18W+18W, it is recommended to use a 2.5-4 inch, 4-8 ohm 10-30W full-range speaker. Bass output: TDA2030Ax1, power: 18W [≤ 250Hz], 5-8 inch, 4-8 ohm 20-50W bass speaker is recommended.